A question came in from a potential client last night, and after writing a long answer, I thought it was probably a good idea to blog it and place the answer on my site! The question was for a potential European event, and really had to do with whether I could work with an a European / international audience, be respectful in my timing, work with the translation team, work with simultaneous transition, and provide enough regional or localized content. The answer is yes, yes, yes and yes….! On stage in Sao Paolo for the Worldskills global conference. My audience featured individuals from 85 countries. My mother tongue is English, and sadly, while I don’t speak any other languages (despite some 10 years of French lessons in elementary and high school! ), I regularly speak on an international basis. This involves working with translators. focusing on international content, and working to keep my pace slow enough for the audience to be respectful of their needs. global audiences. I do a LOT of international work; I’ve presented in Sao Paolo, Budapest, Munich, Athens, Stuttgart, Prague, London, Paris, Brussels, Ghent, Stockholm, Zurich, Tokyo, Mexico …. and in all of these situations, have ensured that I have slowed my pace to be respectful of the audience. a long track record with stage translation. I’m based in Canada and have been on stage for 25 years. Given that, my earlier years featured several hundred (!) events that have involved simultaneous translation (English/French) with headsets/translations. It’s just a thing in Canada! sequential translation experience! My Budapest event actually featured sequential translation into Hungarian as opposed to simultaneous translation. Tthat was kind of fun, since my translator was actually on stage with me, followed me around, and even mimicked my stage actions! There are many relevant examples of the international work I have done. I just keynoted Nikon’s 100th anniversary dinner in Tokyo, with an audience from 37 countries. I provided my slide deck in advance to the translation team; I was simultaneously translated into Chinese and Japanese. in January, I keynoted the first leadership meeting for Ulker; the parent company is Turkish, and the meeting represented the entities of the corporate group with the leadership team for Godiva Chocolates (Belgium), Ulker Biscuits (Turkey) and McVitie’s Biscuits (UK), but with individuals from each of those 3 groups from around the world; a secondary booking had me with Godiva’s global supply chain team from 25 countries. Both massively global audiences. Accenture had me speak at their annual energy conference in San Francisco; we had utility executives from China, Japan, Russia, Philippines, India, and 26 other countries. In that case, I was simultaneously translated into Russian, Chinese, Spanish and Japanese! my keynote for the Worldskills conference in Sao Paolo featured simultaneous translation into Portuguese and Spanish. It’s not the cover of the Rolling Stone, but I was once featured on the cover of CEO Magazine Hungary. The only speech where I had armed guards in the room with Uzis! But that’s another story for another time! The answer is yes – I can easily and often do that do that. Many of the client bookings above have involved a necessity where my examples include global, not North American centric examples.I am regularly booked and work with content that is specific to the folks in the room. And so my Godiva Chocolate supply chain event included retail trends from Asia, India, the Middle East. My Dow Chemical talk took a look at global trends with examples for many of the different groups in the room. The fact is, I do *extensive* research as a part of my talk, and regionalization is part of what I bring to the table if we need to do that with the content. I work hard to alleviate the concerns of any clients who book me, and this includes translation and internationalization. So – pick up the phone and call me. Let’s chat! The BBC gave me a call to chat about what is really going on with the Internet of Things (populalrly known as IoT) … and ended up running a great summary of our conversation. The article captures the essence of my thinking that it is very early days yet with IoT. We’re at the starting gate in building the most complex machine ever built, and we’ve got a lot to learn in terms of architecture, security, and its’ role. Read more about those issues here and here. I’ve been speaking about IoT for over 20 years : a good example is here. And even here, where I talk about the changing role of light bulbs in the era of IOt. Give the article a read, and see if you agree. The most humble of objects can join the connected world, thanks to what is known as the Internet of Things – the interconnection via the internet of computing devices embedded in everyday objects, enabling them to send and receive data. Smart bathroom scales can log weight and body mass index, then feed the data back to a Fitbit wearable for action; networked dog collars can track a pet wherever it roams, help with training and even detect pain; Amazon’s checkout-free Go stores will allow shoppers to fill their bags and leave the store without queuing or even touching their wallet. The Boston Consulting Group estimates the world will spend $295 billion on Internet of Things (IoT) systems and devices by 2020. Yet, according to futurist Jim Carroll, the concept is still in its infancy. Engineer and futurist Roy Amara observed that people tend to overestimate the effect of a technology in the short run and underestimate it in the long run. Similarly, Carroll believes that when it comes to the Internet of Things, the world is still in the era of inflated expectations that precedes a crash and is followed by more gradual adoption and global dominance. The Internet of Things presents important challenges around security and privacy, which organisations are only beginning to explore. Many manufacturers are still shipping devices with default passwords and user IDs, leaving them ripe for hackers. Privacy legislation has yet to catch up to a world where a single household can emit thousands of data points every day – unconsciously sharing everything from the layout of an infant’s bedroom to the contents of their refrigerator. Experts agree it is still too early to identify which of the myriad IoT businesses will become the new Amazon, PayPal or eBay. No one can predict which will face the fate of dotcom bubble victims such as Pets.com or Boo.com, or prove, like the various virtual currencies that preceded Bitcoin, ideas ahead of their time. Yet some industries are clearly ripe for disruption. By 2020, over-60s will outnumber under-fives around the world. By 2050, there will be two billion people aged over 60 worldwide. In an ageing world, cost-effective elderly care is critical. From wearables that track vital signs through to emergency response systems, virtual assistants and perhaps even internal smart devices swallowed like pills, the Internet of Things will help the elderly live in their own homes, with dignity, for longer. Google and Novartis are developing a smart contact lens for diabetics that won’t just correct vision but will track blood sugar; even the humble floor is getting smart, with systems to detect falls – and ultimately, perhaps, prevent them. If climate change is the single biggest threat our planet faces, then the smart grid is key to the European Union’s battle against it. By 2020, almost 72% of EU consumers will have an electricity smart meter, part of a smart grid rollout that could slash the union’s carbon emissions by as much as 9%. By saving energy on operations, helping consumers monitor their usage and even feeding stored solar energy back into the grid, smart meters reduce a household’s carbon footprint. Networked to IoT devices elsewhere in the home, such as thermostats, lighting controllers, refrigerators and washing machines, they will cut emissions even further. Globally, one-third of all food produced for human consumption is lost or wasted – that’s over 1.3 billion tonnes every year. For food businesses, IoT technology can help cut waste, whether by monitoring perishables on their journey from farm to store or identifying patterns that cause food to end up in the rubbish bin. In the home, smart refrigerators can warn when food is approaching its use-by date, send real-time information on their contents to a shopper in the supermarket to avoid double-buying – and, of course, remind consumers when to stock up on milk. In California, the city of San Diego is upgrading some of its streetlights to install 3,200 sensors, transforming them into a connected digital network. The anonymised data should help monitor traffic, pollution and carbon emissions, identify crimes and assist first responders, and even help visitors find a parking place. And in Taiwan, the engine room that fabricates many of the hardware that powers the Internet of Things, government and mayors are embracing the Smart Cities movement. The nation that manufactures the Amazon Echo smart speaker hosts an annual Smart Cities summit and is equipping its own urban centres with a low-power wide-area network tailored to the Internet of Things. In the capital, Taipei, a network of sensors already monitors pollution – driverless buses that collect data on road conditions and traffic are undergoing trials. Local smart scooter start-up Gogoro, which operates on user-swappable batteries, just launched its first solar-powered charging station. In the southern city of Tainan, Acer has developed a smart parking app that enables users to find parking spaces quickly, as well as paying parking fees and parking tickets through a licence-plate recognition system. It was also in Taiwan that German luggage-maker Rimowa chose to launch its smart-tag system, meaning passengers on EVA Air could check in their bags via smartphone, saving time at the airport. One recent client engaged me for a talk for their global team, with the keynote title “Achieving Agility: Aligning Ourselves for an Era of Accelerating Change”. That’s a good example of how I outline the attributes for success in a world of high velocity change. With that, I focus on how organizations and leaders must incorporate four key capabilities: agility, insight, innovation and execution. Corporate agility concept is perhaps the most critical: organizations must presume that the rate of change today is so fast that product lifecycles are collapsing, business models are relentlessly shifting, and customers are unforgiving and fleeting. To name just a few key trends! 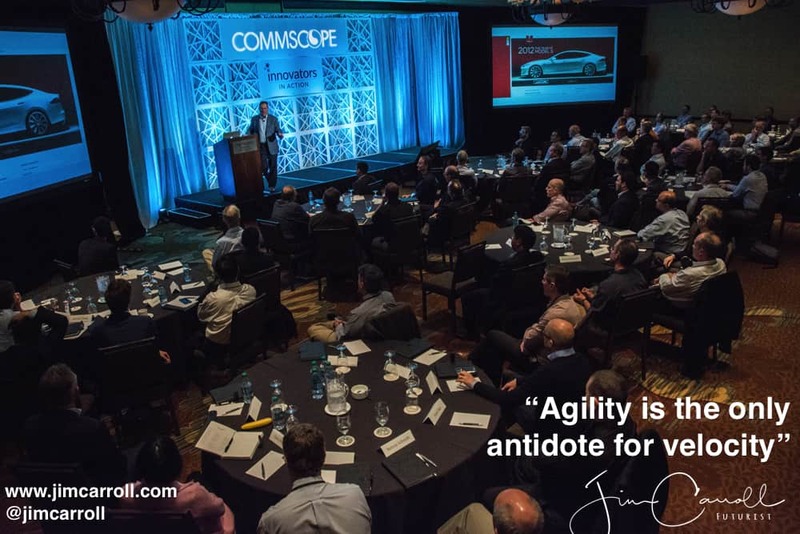 Agility implies that we must innovate and adapt based on rapidly changing circumstances, on a continuous basis. To me, that’s what agility is all about!